High-quality packaging not only ensures food products remain fresh, appealing, and safe to eat, but also enhances food quality. Trans-Packers-Services Corp. offers contract food packaging, blending, and manufacturing services above and beyond the industry standards. In Summer 2018, our contract packaging company moved our operations to a new 100,000-square-foot, state-of-the-art packaging facility in Piscataway, New Jersey. We are easily accessible from all major East Coast trucking routes, three major international airports, and the Port Newark-Elizabeth Marine Terminal. Established in 1969 in Brooklyn, New York, Trans-Packers-Services Corp. is now in its third generation as a family-owned and managed business. We have over 60 unique and diverse machine lines to fulfill all your packaging, blending, and manufacturing needs. Part of our packaging facility is USDA dairy certified. We have expertise in food pouching as well as bottling and canning for powders, particulates, and liquids. From foodservice industries and retail markets to military bases and other institutions, Trans-Packers-Services Corp. caters to a wide range of clients. 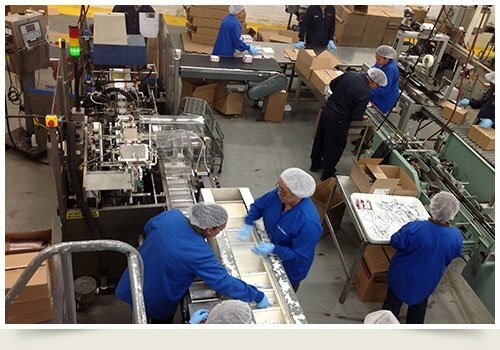 Contact us to learn more about the food packaging services we offer and how our packaging facility can best help you!